As young Muslim men disappear into US prisons for ‘pre-crimes’ they haven’t committed, activists demand justice. On a miserable Monday evening in early April, when most people were scuttling for the nearest subway, a motley group was huddled before an unremarkable grey building in lower Manhattan, declaiming into the rain. 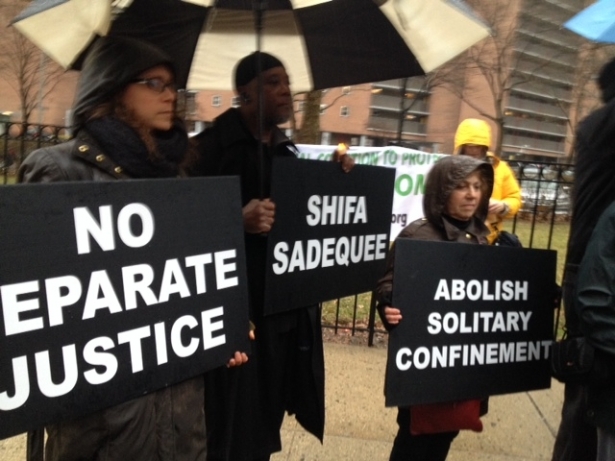 The woman was Cara Page, Executive Director of the Audre Lorde Project and a prominent black queer activist; “Shifa” was Ehsanul “Shifa” Sadequee, a young man convicted of terrorism-related charges five years ago. The two had little obvious in common, but Page had been in Atlanta at the time of his trial and a member of the Free Shifa campaign, a coalition of supporters who argued that his prosecution and detention were unjust. It was proof, they said, that the inhumane detention of “War on Terror” suspects has occurred on American soil, too. Years later, most of the world had moved on from Sadequee’s story, but Page, like the others bundled around her, had not. “We’re gonna build a nation / that don’t torture no one / but it’s gonna take courage / for that change to come,” chanted Luke Nephew, a Bronx-based spoken word poet who had trekked to lower Manhattan for the vigil. After singing a few rounds the rest of the crowd joined in. Friends and strangers locked eyes and nodded—a small moment of peaceful resistance in the face of an uphill struggle. A jury found Egyptian-born cleric Abu Hamza Al-Masri guilty of 11 terrorism related charges Monday afternoon in a New York City courtroom, paving the way for a potential life sentence. 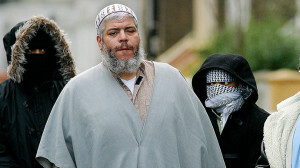 The 12-person jury deliberated for only just as many hours, Reuters reported, before finding the 56-year-old former London imam guilty of all 11 counts he faced. According to a New York Times report from 2012 shortly after he was extradited from the UK, the cleric told the court he wanted to be addressed by his birth name, Mostafa Kamel Mostafa. The US had successfully sought his extradition for eight years after he was indicted in the US in 2004 for various terrorism related charges. Until then, Mostafa was serving time in Britain after being accused of inciting violence there, where he had gained notoriety for fiery sermons delivered as a at London’s Finsbury Park mosque. Combined with his indistinguishable appearance — Mostafa is missing one-eye and both hands—the cleric had no problem making waves on both sides of the pond.